The title is quite the proclamation, but I stand by it! I’ve seen a few variations of these cookies floating around the web and finally had to try them. OMG. I’m totally not the type to say or write or even think ‘OMG’, but OMG. I have to say, though, what makes them so great for me is the fact that they require so little sweetness to be really stellar. 1/4 t. cinnamon optional, but delicious! I got about 9 smallish cookies from this dough, but feel free to make them as big (or small) as you desire! These have a buttery, modestly sweet taste that’s complimented perfectly by the dark chocolate. The cinnamon gives it a little spice that pairs well with all of the other ingredients. UPDATE: For those of you with almond or nut allergies, I have successfully made these with sunflower seed meal (using the same amount), and they have turned out great! Hello Lauren! Your website is awesome! 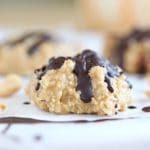 I was wondering if I can use Oat Flour in the place of Almond Flour in your chocolate chip cookie recipe? Haha, I’m so happy you liked them Claudia! Since creating the recipe, I’ve become allergic to almonds, but I remember how good they were. Enjoy my dear! I just made these tonight. I LOVE the cinnamon with the chocolate! I didn’t add the water and my dough never formed together, so I added about 6 T. of almond butter with the thought that it would help stick the ingredients together. It worked ok, I’m wondering if adding a 1/4 c. coconut flour would help the dough stick together. I will be saving this recipe and eating them again! Thank you for sharing! Found this recipe two years ago and I find that these are the only cookies I have been baking. Everyone I make them for loves them. Thank you, Lauren! I was looking for a quick cookie without eggs or butter as I was out of both. For the teens, I used flour and they were ok. The other batch, I made as you suggested, including the cinnamon. They were awesome! My teen, who is a picky eater, LOVED THEM TOO!! I nearly fell over when she asked me to make more sans the cinnamon. WOO HOO! Hi Lauren I made these just now and they did not form into cookies they ran all over the tray and joined together into one big mess. I didn’t add any extra water. As for the taste…. well it’s a big claim to say that they are the best. I am not convinced. I love these cookies. Being a person who was formerly overweight (220lbs at 5’6″) and now down to 138lbs it is nice to indulge once in a while without feeling guilty. 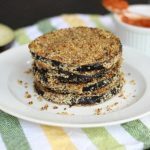 I have to say I LOVE you blog as you list nutritional info/serving size, and that is really important along with offering a wide variety of dietary recipes (I am a vegetarian and was raised that way, but became a junk food eater during college, where I gained most my weight as I wasn’t eating any protein). Keep up the great recipes, they help me stay full and live a better life! I made these cookies tonight and they are delicious! The first batch came out flat, the second batch came out perfect. I will definitely make these again. I love that it uses few ingredients and is sweet and tasty. Making these tonight before I go on a big walk called Coast To Coast! Just made these, and they are AMAZING. I used cinnamon, coconut oil and maple syrup and they were light and fluffy! AMAZING! Thanks. Thanks so much for this awesome recipe! I doubled the recipe, used less butter, added oats/chia seeds/a little bit of coconut – they’re amazing! 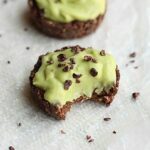 I’ve tried so many cookie recipes with our refined sugar and they always end up tasting like cardboard, but these are so fresh and delicious!!!! THANK YOU! Lol, that sounds like something I would say! 😉 So happy you enjoyed them Christine! Had high hoped for these, and they turned out just like the picture, visually. But they had WAY too much vanilla, at 1.5 tsp for only 9 cookies… most batches that make 24+ don’t even have that much vanilla in them. The result tastes oddly fruity (in a bad way). Also not sweet enough, I would personally double the sweetener, half the vanilla (at least. maybe even use only a quarter) and add a touch more salt… overall not happy with how these turned out. My husband took a bite of one, set it down, and walked away. These really are the best!! I can’t stop eating them 🙂 Thank you! I really like these cookies but have one problem when making them. I end up with about half the amount of batter you show above. Did you by chance use a liquid measure cup instead of one for dry ingredients, for measuring the almond flour? It looks like way more than a cup in your video. My batter is also more of a paste. Delicious, all the same! Not sure what you’re seeing, but I used measuring cups for the dry, nothing out of the ordinary. Glad you enjoyed them! Almond flour is unique in that it contains a decent amount of fat, which lends itself to the ‘buttery’ taste of the cookie. I’ve personally tried oat flour, but resulting cookie is quite dry. You may be better off looking for another recipe or holding off for the correct flour. How did you get your almond flour to be “Smooth?” I followed exactly as you said/showed and your batter even looked smooth compared to mine. I used Bob’s Red Mill finely ground almond meal/flour. The cookies look nutty not smooth like a regular cooked baked with regular flour. Any suggestions? I’m not entirely sure what you mean…I used TJs almond meal, which also has a ‘nutty’ look to it. Almond flour doesn’t have the brown flecks in it (if that’s what is troubling you), so maybe that would work better? I made cookie-brownies with this recipe and your ‘No Pudge’ brownie recipe and they were delicious! Thanks!! Followed your directions…used honey and butter and almond flour…WOW!! A keeper and no exaggeration of how wonderful it turned out just as promised – but key would be following the directions!! Thanks so much!! Hi! I just made these cookies and they were delicious! However, they were SUPER oily, like I was wiping excess oil up with a paper towel before I baked them because there was that much oil. I didn’t add any extra water, either. Any idea what caused this or what I could do next time to prevent this? I’m not sure since I’ve never had that problem and no one else has told me that! There is a decent amount of fat in here from both the coconut oil and the almond meal, so there is bound to be some of that…. One other thing I just thought of, be sure not to overmix the ingredients…this will bring out the oil in the almond meal (like when you make a nut butter in a food processor) and that would definitely cause excess oiliness. Just tried them and balled them up. They did not flatten while cooking. Should I have flattened them prior to baking? I followed your recipe exactly except substituted 15 drops of vanilla stevia extract for 2 of the tablespoons of honey. Could that have kept them from flattening in the oven? Also, have you tried making these with at least one egg in the recipe? Wondering how to work an egg in. Thanks! I think the problem was substituting the honey. I don’t usually have to flatten or manipulate them in any way, I just dollop the batter onto the sheet. I haven’t tried them with an egg either, but I think another commenter had success with that! Good luck if you try them again! Can I sub 3T of ghee instead of oil or butter? Thank you, thank you for this delicious recipe! 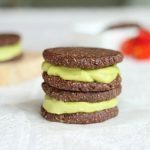 I am vegan, not paleo, but I don’t eat grains and had not found a good grain-free and vegan cookie recipe until this one. I make this a few times a week, and have even changed it up by using raising instead of chocolate chips, and it’s delicious. A great “forumla” for endless cookie ideas. Thanks!! i just assumed they would spread out. but regardless they are delicious. thank you Lauren. 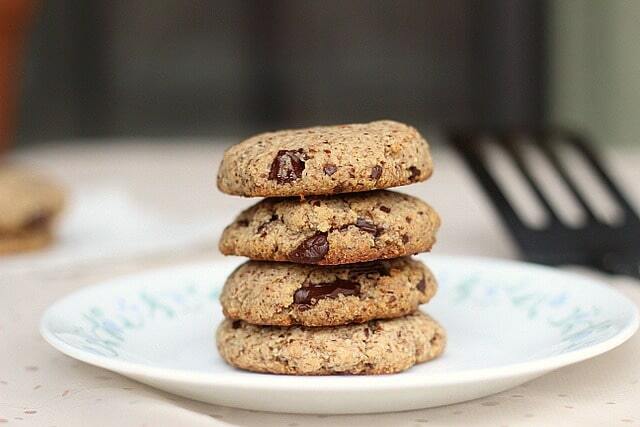 Cannot wait to try mny of your recipes…..
Hi, i just made these cookies. They are delish but mine did not spread and when i pushed on them they flatened out. Should i have added some of the water possibly and/or cooked them a bit longer also? Again the taste is wonderful but…. and to the almond meal….do you use Trader Joes? or blanched almond flour? 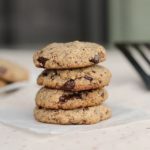 This really is the best paleo cookie recipe I’ve found..chewy and delicious! I doubled the recipe because 9 cookies aren’t nearly enough 🙂 Also added 3 Tbs of cacao nibs for even more flavor, nutrients, and crunch. I did find my cookies didn’t spread as much as I had hoped, so next time I’ll manually help them out a bit more. Yum! I know its been said a million times already but these cookies are amazing! I have some friends who are gluten free and I always like to have something freshly baked for them when they visit. These are so easy and fast to make. My biggest problem is that it’s hard for me to not eat all the cookies myself when I make them! These cookies were delicious! I’ll definitely double it next time! These cookies came out great! Delicious. I’ll double the recipe next time because this yielded 8 cookies which were not enough! Ok, making these again today because they are freaking awesome cookies! Nice post, but it’s too bad you were going for Vegan, they really could’ve used egg to hold them together… maybe even flax egg? They were too moist and fell apart even though I followed your directions exactly. Interesting, did you let them cool completely? I’ve had many positive comments and no one has seemed to have the same trouble! I made these last night and loved them! I used butter and cinnamon honey (instead of cinnamon & honey). I am hiding them in the freezer as I type this. Thank you so much, Lauren! I doubled the recipe and the ingredients, however, my husband said it was way too salty. I threw them out. Please advise. 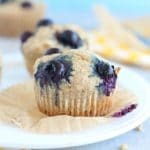 Could you make these with coconut flour? If so, how? I’m not sure, you may have better luck googling ‘coconut flour paleo cookies’. I really appreciate the nutritional information especially the carb count as my young son has type 1 diabetes. You have saved me a lot of maths especially when the recipe is measured in cups and spoons!! Thank you. These are baking in my oven at this very moment. It is 7:26am but that’s OK with me! I can’t wait to taste one. 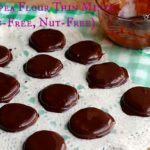 I came across these while looking for an egg-free baked Paleo dessert, and they sounded too simple to be really good. WOW, was I wrong! These are riDICulously delicious! So easy to make, and soooo tasty! I have missed cookies, as the Paleo versions usually are lacking in some way. Thank you so much for this recipe!! Made these tonight for my very picky husband and 2 sons. They ate every last one of them!! I’ve made healthy cookies before and they turned their noses at them- Well.. Well … Well. …. We have a winner!!! when i place the cookies on the cookie sheet do i round them like regular cookie dough and theyll will flatten on its own or do i form them as the shape of the cookie? No need to form them or round them, just scoop a large tablespoon of batter (depending on how big you want them) and place it on your cookie sheet. They will flatten a bit on their own. Happy baking! I’m so happy you enjoyed them! For the crumbly issue, be sure to let them sit on the pan for the stated 5-10 minutes before moving them. This is what help them set. Happy baking! These cookies are amazing!!! They taste exactly like Tate’s cookies which are my favorite. I flattened mine before putting on the sheet and they came out thin butter crispy and soft on the inside. Great recipe! Takes 3 minutes to make and only uses one bowl, always a huge plus. Making them again tonight for a dinner party. These are better than any chocolate chip cookies I’ve had. My brother (who is very picky and a good cook) loves them – he says they taste like chocolate macaroons. My 13 year old son that claims to dislike anything with healthy ingredients loves them too. They are good hot or cold. I don’t add any water to mine. That’s great Marcia! I’m so happy you liked them! OMG! These were awesome! I made them for several non-Paleo friends who DEVOURED them! ANd they are super easy and quick! I was surprised you didn’t put eggs, but they are the best ones I’ve had yet so who needs eggs!? Sounds delicious Lindsey! I’m so happy you enjoyed them! I agree theses are the best!! Been making them for about 6 months now. We never need to add water or almond milk. Also, our favorite is using 2T grass fed butter and 1T coconut oil. Thanks so much!! Thanks Christina! I’m so happy you enjoyed them!! Just made these! Best paleo chocolate chip cookie I have made! Did not use any water. Thanks! OK, so I have made these cookies more times than I can count! Seriously. They’re hands down the BEST chocolate chip cookies! I think I’ve perfected them by using half coconut oil and half ghee and half honey and half maple syrup. It makes for the perfect combo! I also use almond flour instead of almond meal which seems to have a better consistency for the cookie. And I use the Enjoy Life chocolate chunks because….why not?…..they’re delish! Love this recipe! I added rolled steel oats to it to give it some substance and they are awesome. Such a good idea when looking for a healthy alternative during the holiday season. Had to repost it! Thank you again! I don’t like them. I looooove them. 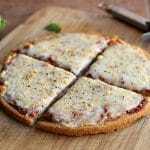 Had my friends try them they love them too I have forwarded your site to them. I got this from my friend, Sara. She forwarded your site to me. So, thank you again! Here’s to healthy treats! Just wanted to thank you for this amazing chocolate chip cookie recipe. It really is the best chocolate chip cookie ever! Amazing! thank you! looking forward to trying more of your recipes. More power to you! Thank you Chechel! I’m so happy you liked them! These cookies were very good, but how do i keep them from going flat. Hmm, I’ve never had mine go flat. They look like what you see in the pictures. It sounds like you may have added too much water? The batter should be fairly thick and hold its shape for the most part. Ok, these are dangerous!!! I ate all 9 cookies in one day!!!!! And my 2 year old LOVES THEM! So easy to make. Thank you! These are in the oven, I tweaked it a bit, mostly almond flour, but a couble tablespoons of coconut flour for giggles. Used enjoy life mini chocolate chips and a handful of chopped walnuts. Made 12 using a tablespoon to scoop! They turned out perfect! Warm chocolate chip cookies while it snows? yesssss! These are wonderful, amazing, delicious, heavenly, and perfect. I did not have to use water at all. I was skeptical– and pleasantly surprised, as all of the other paleo cookies I’ve tried use egg. I used grass fed butter instead of coconut oil. Really just scrumptious. Thank you! Thanks for the comment Josiah, I’m happy you enjoy the cookies! That sugar count is erroneous!!! 2 T of honey is well over 20 grams of sugar! How did your measure come out to 5 grams? Wow Alex! Yes, the numbers are correct. Read a bit further and you’ll see that the facts are based on 1/9 of the recipe, meaning one cookie out of a batch of nine. I also noted that the facts are based on using maple syrup. Using honey would up the amount by about a gram. No need to get so hostile. It’s just food. These look great! Do you think it would work to sub applesauce for the oil? I’m not sure…they may turn out more cake-like if you do that, but let me know how it turns out if you try it! I have been playing with a paleo diet for a while now and have not yet had a baking success. I tried making these cookies today, and they came out perfectly the first time!!!! I also made a batch of cookies from another website’s recipe to do a taste test. Yours won hands down! Thanks so much for this recipe. As someone who loves eating paleo but misses sweets, thank you. These were incredible. I added some unsweetened, shaved coconut and omitted the vanilla because of the alcohol content and they came out splendidly! So excited to try these cookies! Do you think it would work if you did half butter and half coconut oil? Can’t wait to make these! Thanks for posting the nutrition info! One of the happy recipients of my baking is my 13 year-old, who has type 1 diabetes. If I can’t get the nutrition info, I have to calculate it myself, so I always appreciate it! This recipe is amazing! I made it twice tonight – once with honey and then maple syrup. We loved both! 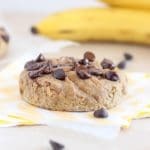 I’ve tried many paleo chocolate chip recipes and this is by far the best! Thanks! Is the serving size 1 cookie if we made 9 total? BTW these cookies are so so amazing. last night, me and my sister were craving some cookies and we could not find a single paleo recipe that we had all the ingredients at home ready to use. So we found this recipe and they were absolutely amazing. These are seriously the best. I went the coconut oil/maple syrup rout, and definitely used the cinnamon. I don’t think I’ll ever want a standard cookie again. I must have done something wrong. Mine flattened out like pancakes and crumbled like sand when I took them off the paper. I did 3T of water because I didn’t want them to be too dry. Maybe that did it? 3 tablespoons? The recipe says teaspoons, so I think you did use too much water. Ooh no I just wrote it wrong, I did use teaspoons. Perhaps then you only need one teaspoon? It just sounds like you added too much water. It should be cookie batter consistency. You may not need any water. 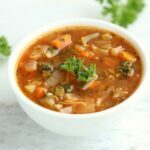 Being pregnant and paleo can be a huge challenge with curbing the craving for sweets and breads, but I have a feeling this recipe will be an absolute life saver! Thank you so much! Im going to try these out right now since Ive been wanting sweets all day ! Do you think they would work for a coconut milk ice cream sandwich? Maybe I should whip up a batch of ice cream too! Your title is correct! I’ve just recently converted to paleo and it’s been hard giving up all the processed sweets! I was honestly afraid to taste these cookies after I made them. No milk, egg or cookies? I thought they would be disgusting! (No offense ) When I tasted them I was presently surprised! They were great and even regular cookie eaters like them! They are such a great recipe to substitute for the high sugared sweets! Thank you! Hi Lauren, I was looking for a quick cookie to make this morning and found your recipe! The raw batter alone is AMAZING! Can’t wait to try the cooled baked cookies! Thanks so much for the recipe! I baked them tonight (my first time baking paleo style ever). They came out really tasty but fell apart:( what could I have done wrong? Hi, I was just confused about the nutrition facts. Is each cookie 139? Just made these for my husband who is on the paleo diet and has bad reactions to dairy, egg and chocolate. 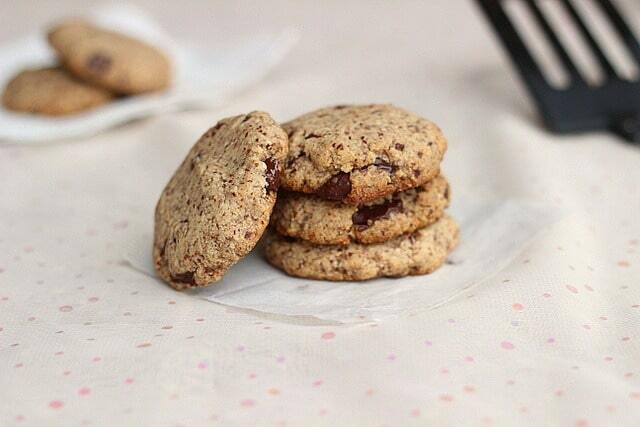 I subbed Carob chips and they are better than some regular cookies that I’ve made in the past! Thanks so much. These are delicious. These cookies taste like heaven. I also had trouble with the ‘runny’ consistency of the batter and the end product. I added no water either. Maybe cook longer? Thank you! Just made these with xylitol for low-carb and posted on Instagram. Holy moly these are delicious!!!! I have the biggest sweet tooth and sweets and cookies has been the hardest thing since going paleo. 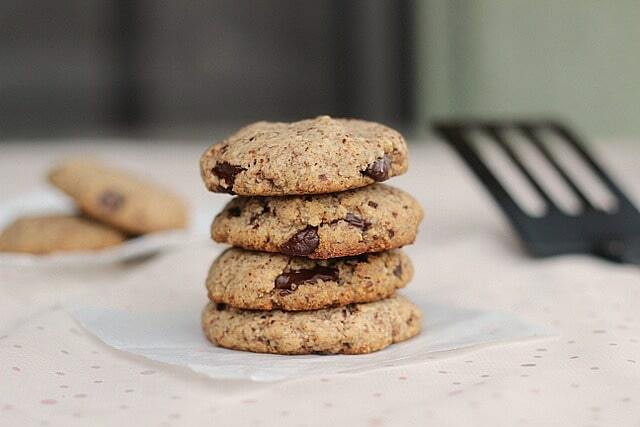 These are even better than regular choc chip cookies! Now I just have to try and not them all in one day. Thanks for this amazing cookie recipe! Just made these and they are wonderful! 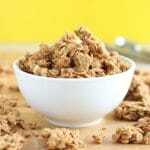 Do you think the almond meal could be substituted with coconut flour? Coconut flour is kinda weird in how you substitute it. I’ve read that you use 1/4 cup of it for every 1 cup of flour. As far as using it in place of almond meal, I wouldn’t do a one to one exchange, as I think you’d end up with very dry cookies. Okay, just for clarification, is ALL the “Nutritional Information” for 9 cookies or for ONE cookie? The recipe makes nine cookies and the nutrition info is per cookie. My SIL, a fellow foodie and raw milk drinker, just emailed to say these were really good. Now it’s my turn to try! Also, not to sound like a broken record but 9 cookies are really only 139 calories!? This is definitely gonna help with my sweet tooth AND my workouts. Thank you! Haha, sorry Frank…EACH cookie has 139 calories, and the recipe makes about nine. Hope that doesn’t burst your bubble too much. 😀 Let me know what you think though!! Thanks so much for posting this Lauren! I need a little sweetness in this paleo lifestyle. I can’t wait to make these this weekend. 😀 You’re awesome for posting this recipe!! When you say 3 T, do you mean tablespoons or teaspoons? Omg, I made these last night and they came out delicous! Two things, though; is the serving size really 9? Or did you mean to say the reciepe yields 9 cookies? Secondly, although my batch tasted great the dough was really runny so i ended up with really flat cookies that were crisp on the ends and soft in the middle. They looked like crackers! To be honest It was a good mistake, lol. They reminded me of these flat, crunchy cookie type things my mom used to buy years ago from Costco. And I may half the honey, they were sweet little suckers! Anyway this is most definatley going in my “tried and true” reciepe booklet. I’m happy you enjoyed them! I did mean 9 cookies, not serves 9 people, lol. As far as the batter goes, it sounds like you added too much water…? I’ve never seen them ‘runny’, if anything the batter gets too thick, hence the water. I’m glad it was a good mistake for you though! Lauren, these cookies are so amazing! I’ve been experimenting with many different recipes and these are by far the best yet! It’s also fantastic to come across a recipe that uses ingredients I always have on hand in the pantry and can be whipped up for surprise guests. Would you mind if I shared this recipe on my blog at some point? Of course giving credit to you. Either way- thanks for sharing this delicious recipe. Will do! I posted a picture of the ones I baked on the Facebook page along with your recipe link. My friends can’t wait to try them (especially since they’re vegan too and we can all share)! Are these crunchy or chewy when fresh? I would say (once they’ve cooled) they’re a bit crisp on the outside and soft in the middle. Yum! These look so good. I’m always a bit too scared to try cookies in case they’re so good I can’t stop! Great recipe! Thumbs up from hubby. My sister just started the paleo diet. I will pass this recipe along! Thanks. Hi Lauren. I’m going to include this on today’s Friday’s Five . . . and was going to use my “pin” to showcase it, but I can’t get it to work. I hope you don’t mind that I snag one of your pictures to use instead. I will definitely link it back to you! Let me know if you don’t want me to do this, though. I didn’t take my own pictures when I made them, figuring I’d use Pinterest. 🙂 Happy Friday! Okay, well, I am making these tomorrow for sure. Fabulous!! What great ingredients. I think I’m going to try this recipe tomorrow! Can I substitute actual butter for the coconut butter? Thanks for sharing this. Can’t wait to try. Ooh yum, you know I love me some cookies! I’m really impressed by the ingredients list – particularly the sweetener. Nice going! These look so tasty!! Thanks for sharing :). 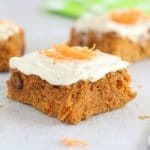 I love how simple these are, that I have all the ingredients in my pantry and that they are paleo AND vegan! If I didn’t already have 4 kinds of cookies in my fridge (baking party with a friend) I would make these now. I guess they’ll have to wait a few days. Darn! On another note, these are really good! You ought to try them, I think you’d really like them! :-)….and they freeze well! These do look awesome! I love the simple ingredient list . . . no items that I’d have to go hunt down at a specialty store. Perfect!! Oh yum! I love how you used almond meal. I make my own almond milk and I am always looking for ways to use up the leftover meal. Going to try this. Thanks! Sorry, I actually did not mean dried almond pulp. I’ve actually tried it that way, and it WILL NOT work! I believe it lacks the fat that is needed here. It does actually work with the almond pulp IF you dry it out in the oven at the lowest temp for about three hours, put it in a food processor to make it fine like flour – then make them. It’s delicious!! LOVE these cookies!!! The only thing I did was add more coconut oil and they turned out so good. I made these with coconut sugar and they taste great. They are not shaped like cookies when they are cooked. They flatten out. They are very soft. A coworker tried them and wants some more.